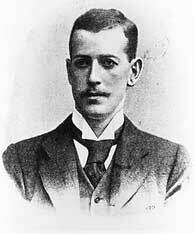 George Stuart Robertson: An Englishman at the first modern Olympic games. An Englishman at the first modern Olympics, 1896. TO THOSE WHO followed closely the preliminaries to the revival of the Olympic Meeting, it appeared certain that the games would be a disastrous failure. This was not the case, though the nature of the success obtained can scarcely have corresponded with the expectations of the promoters. These games differed from other athletic meetings in one most important feature—they did not stand or fall with the excellence of their athletics. Their promoters obviously expected that prodigious athletic results would be obtained, they expected to see the best athletes of the world perform the toilsome journey to Athens to win the olive branch of victory. It was apparently forgotten that few athletes are classical scholars, and that still fewer have either the time or the money to make so long a voyage. Then, too, what we may call the international perspective of the committee was at fault. They seemed to suppose that the participation of all nations was of equal importance to the success of the games. They did not consider, or, if they did, they gave no indication of having done so, that every nation except England and America is still in an absolutely prehistoric condition with regard to athletic sports. Unless England and America took a large share in the Olympic meeting, it was bound to be an athletic failure. In this matter the committee pursued the suicidal policy of devoting the greater share of their attention to Continental athletes. The original programme and book of rules was printed in French. 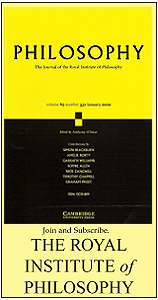 Later on there appeared an edition in German. This, however, was disowned as unofficial by a member of the committee to the present writer, though as a matter of fact it had been sent to the Cambridge Athletic Club as an official document. It differed in some not unimportant particulars from the French edition. But the really notable point is, that no edition of the rules was ever issued in English till very shortly before the games, when a private firm produced one. This, when we consider the importance of English and American athletes to the success of the enterprise, is really an extraordinary fact. It seems as though in the committee’s eyes true internationality in athletics was equivalent to international mediocrity. Of all Anglo-Saxon athletes those at present in residence at Oxford and Cambridge were the most likely to be able to take part in the meeting. 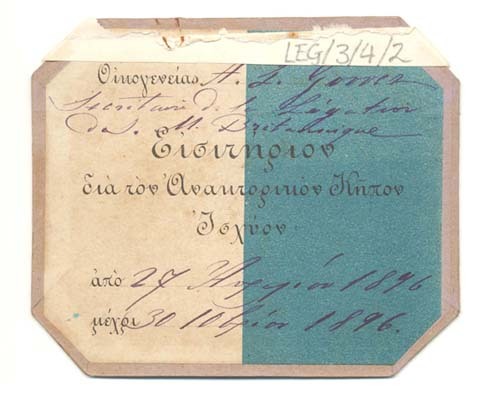 The Easter Vacation was exactly suited for a visit to Athens, and the English University man would, of all men, require the least pressure to induce him to pay a visit to Greece. 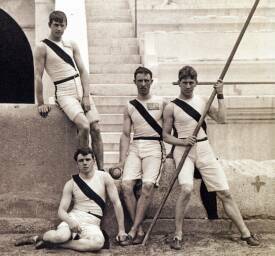 What was done to persuade Oxford and Cambridge men to compete in the Olympic Games? Practically nothing. Two Englishmen represented England on the international committee, but neither of them had any present connection with the Universities. An obscure notice, indeed, was posted up in Oxford and a paragraph inserted in an unimportant Oxford journal, but it was not till March, so far as can be ascertained, that any direct appeal was made to the Presidents of the University Athletic Clubs. Even then the inducements and persuasion directed to them were of the mildest nature. It is, therefore, unjust to blame English athletes in general and University athletes in particular for not having taken part in greater numbers in these games. When an athletic meeting is scarcely advertised at all, and when an invitation to competitors from a certain district is markedly omitted, it is only fair that they should conclude, firstly, that the meeting is unimportant, and, secondly, that their presence at it is not desired. Of the method in which the committee dealt with the athletes of America, we are not in a position to speak. The manner in which American athletics are organized, and the system by which athletic teams form part of great social clubs enabled a fully equipped team of American athletes to visit Athens. The Boston Athletic Club furnished the greater portion of the team, and there were also two of three excellent athletes from Princeton College. 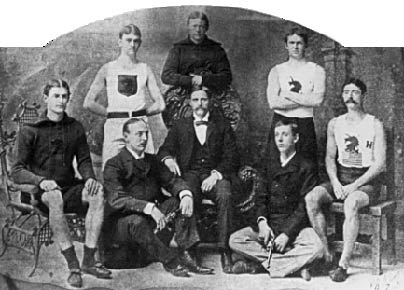 We may venture to say, however, that the effort which this American team made to come to Athens, was not due to any overwhelming persuasion on the part of the international committee, but to the natural enterprise of the American people and to the peculiarly perfect method in which athletics are organized in the United States. ENGLISH ATHLETES, SEEMINGLY, waited to be invited to go to Athens and consequently never went. Those, who did go, did not go as representatives of any club, but, for the most part, as private pleasure-seekers. They won the 800 and 1,500 metre races, the single-handed weight-lifting, the single and double lawn tennis, a victory in μουσική, and a second place in several events. Their total number was six, of whom one was resident in Athens. The bulk of the competitors was, therefore, Greek and Continental, and it may be safely asserted that their performances were not of the highest class. In fact, wherever an Anglo-Saxon appeared as a competitor, he defeated his foreign opponents in practically every case. The French, who, we fear, were largely responsible for the mismanagement of the international arrangements, sent several athletes, who were lamentably unsuccessful. In the 800 metres race Lermusiaux, the only even passable runner among them, contrived to win a heat in a very poor time, but none of their other runners did anything. Their successes were confined to bicycling and fencing, the latter a form of sport in which they have long excelled, the former a kind of exercise, by many scarcely admitted to the domain of sport, in which they are rapidly conquering a kingdom. The French, in fact, have not progressed so fast in the cultivation of athletics as other Continental nations, who have adopted the practice of them. The reason is somewhat hard to discover, but it is probably to be found in a certain impatience and lack of necessary physique. The Germans wisely confined themselves for the most part to those gymnastic exercises in which they are so extraordinarily proficient. Three of their party competed in other forms of sport; of these Hofmann of Giessen was a good second in the 100 metres, while Schumann, a little, elderly man, seemed to compete in every event. On the strength of this we have seen him termed “the best all-round athlete at the games,” but, in reality, he would have served his reputation better, had he refrained from exhibiting himself in many of the events in which he competed. His victory in the wrestling, however, was gained by sheer pluck and presence of mind, and his gymnastic performances were excellent. Here we may notice incidentally another fault in the organization of the meeting. This arose from an incorrect idea of the relative importance of ‘different branches of athletics.’ It may be replied that, if an event is once admitted into the programme of the games, it should be treated as on an equality with all the other events. We do not agree with this view. The climax was perhaps reached in connection with the vaulting horse. There were two olive branches, medals and diplomas granted for this exercise, one for leaping the horse, the other for manoeuvring upon a horse with pommels. The exercises performed in the first of these divisions seemed to the athletic and ungymnastic eye to be puerile, and those in the second division little less so. One would at least have expected to see some fine running vaulting from a springboard, as in English gymnasiums. Yet the winners received the same olive branch as the winner of the 100 metres; even the seconds in these absurd gyrations gained the same laurel branch as the second in the Hurdles. They were proclaimed Olympian victors, they returned to their native Germany and Switzerland with a halo of glory, while the second in the 1,500 metres, for instance, a fine runner though quite untrained, had to recross the Atlantic bearing with his the consciousness of merit alone. Of course there can be no graduation of prizes for single events; a winner is a winner, however unimportant be the feat which he has accomplished. But we would suggest that at the next meeting several of these gymnastic and other events should be combined, and a prize awarded for an aggregate of marks. An Olympic wreath is far too precious a thing to be squandered on good form in hopping over a horse or swarming up a rope. The Hungarians were the only nation, except the Americans, which attempted to send an all-around team. They certainly possess the art of self-advertisement to a very high degree. They and their blue and white ribbons seemed to be ubiquitous; if one did not meet them driving in a cab with the Hungarian flag at the mast-head, one found them blocking the traffic in a compact line stretched across the Rue de Stade. In company with the Philharmonic Society of Coreyra they laid a solemn wreath at the foot of M. Avernoff’s statue on the Sunday before the games. Unfortunately their athletic performances did not justify their conspicuousness, scarcely indeed their visit. They won one or two second places in the heats, and one of them finished fourth in the Marathon Race, but, as a matter of fact, their only good performer was a swimmer, who seemed to be really first-class. Wonderful tales had been told of their high jumper, but he did not appear. It is noticeable, by the way, that the German high jumper stood at attention for half a minute after each jump, apparently supposing that it was more important to appear to be undisturbed after a jump that to clear a respectable height. WE HAVE NOT yet described the doings of the English athletes. Mr. Flack, an Australian member of the London Athletic Club, carried off the 800 and 1,500 metre races without any difficulty. He runs with the most perfect ease, and with a stride of superlative length; indeed the Greek journals described his lower limbs as “superhuman.” Mr. Goulding, of Gloucester, was undoubtedly a better hurdler than the American who beat him. His defeat was due partly to the fact that the race was run upon cinders, in the American style, to which he was unaccustomed, and partly to a mistake at the start, which lost him at least two yards. He was only beaten by a foot. Mr. Elliott won the single-handed weight-lifting without trouble, but in the double-handed lift he was defeated by an extraordinary good performer, Jensen, of Denmark. 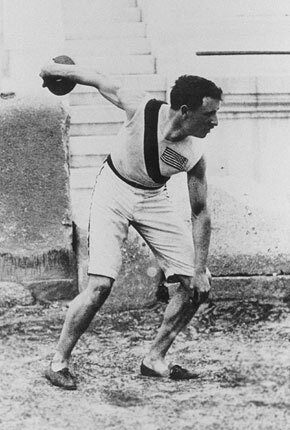 Mr. Gmelin, of Oxford, entered at the last moment for the 400 metres, and gained second place. In the bicycle race from Marathon we were represented by a servant of the British Embassy at Athens. It seems that he would have won had not he collided with a fellow-servant who was accompanying him. A Greek then proved the victor. We are sorry to have to record that it was previously attempted to exclude these two Englishmen from amateur games at Athens on the ground that they were servants, though no one could cast the slightest slur upon their amateurism. This was the more discreditable in the light of their success when they were finally admitted. 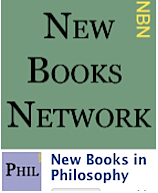 Mr. Boland, of Christ Church, Oxford, who happened to be in Athens as a visitor, purchased all requisites on the spot, and was victorious in the single, and, in company with a German, in the double lawn-tennis. The record of the doings of the American team is practically an account of victory unrelieved by defeat. They were, as they should have been, invincible. Not only did they win almost every event for which they entered, but they also succeeded in gaining second, and sometimes both second and third places in addition. 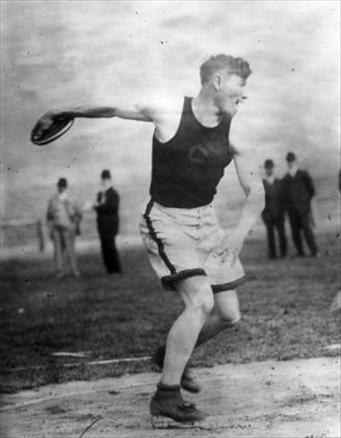 Mr. Garrett, of Princetown, won the Disc and the Weight; Mr. Burke, of Boston, the 100 and 400 metres; Mr. Clark, of Harvard, the high and long jumps. Mr. Hoyt, of Harvard, the pole-jump, Mr. Curtis, of Boston, the Hurdles, and Mr. Connolly, of Suffolk, the triple jump. In the pole-jump and 1,500 metres they gained second place, and in the high and long jumps both second and third places. It must be remembered that the team was formed solely to compete in track and field athletics, though one member entered for swimming, in which he was not successful. Two Americans at large, the brothers Paine, accomplished striking performances in the revolver shooting, winning two events with scores of 442 in each against scores of only 205 and 285 made by a Greek and a Dane. The other foreign countries sent few athletes of note. A Swiss, resident in Greece, was victorious on the vaulting horse with pommels, an Austrian won the 500 metres swimming race, and a Dane the two-handed lifting of weights. 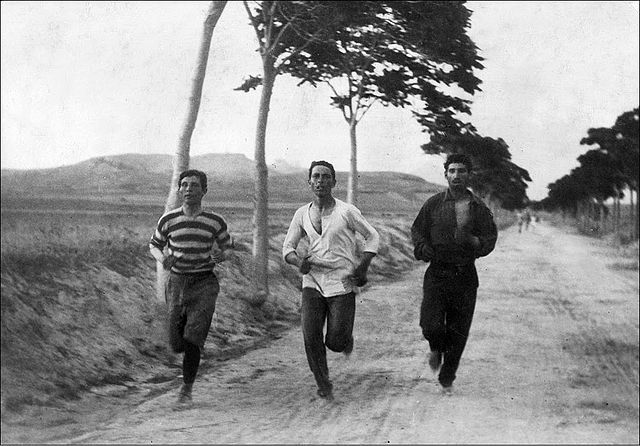 The only Italian competitor, who walked from Milan to Athens, in order, as he supposed, to get himself into proper training, was disqualified on his arrival. IT NOW REMAINS for us to discuss the most interesting point of all—the form shown by the Greeks themselves. It seems to be an undoubted fact that, except for the throwing of a primitive discus, a primitive hop, step and jump, and a modicum of lawn-tennis, athletics were absolutely unknown to the Greeks till two years ago. Then the nation was seized with a remarkable fit of athleticism. A number of clubs were started, and athletics have been pursued with unabated vigour ever since. At the present moment one sees athletics being practised almost at every street corner. Sometimes one discovers infants putting a rude weight, some six times too heavy for them; at other times one finds every man and boy in a quarter of the town long-jumping, with a policeman and a soldier to keep the enthusiasm will continue. The result so far has been that the Greeks have obtained a very notable degree of success, considering the shortness of their training. This is the more remarkable if we consider the disadvantages against which they have had to contend. Their physical gifts do not favour athletics, their disposition is on the whole opposed to active exercise, and their climate renders violent exertion difficult. The great danger is lest they may be led to suppose that they are already a great athletic nation, and do not any longer need elaborate training. It might be thought that their defeats in the Stadium would have persuaded them that they are not yet far advanced in athletic skill, but popular enthusiasm is never logical. Their journalists tend to encourage any nascent feeling of conceit which they may possess. They would not admit for a moment that a Greek over middle height is an exception, that Greeks are usually short and slightly corpulent in figure, and that they perhaps require more training than most nations to induce in them an athletic habit. In fact it is a commonplace for them to compare a well-built Greek to the Hermes of Praxiteles. No modern Greek could possible resemble Praxiteles’ Hermes in the least. We must give Greece full credit for what she has already accomplished in athletics, but it would be fatal to forget to qualify our admission by remembering that her progress is only great in comparison to the shortness of the time which it has occupied. To deal with their performances in detail—they won undoubted victories in the rings and rope-climbing, in which their champions easily distanced their rivals, and in the weight putting Gouskos made a very good appearance. It was interesting to see how his style improved during the competition, owing to his careful imitation of his American rival. The latter only won by an inch, but was putting two or three feet below his proper form. This was due to the size of the square, which had sides of two metres, and therefore corresponded with no known rules. The blunder was the more remarkable as this event purported to be held under English rules. In the Disc-throwing the Greeks were beaten, contrary to all expectation, by Mr. Garrett, of Princeton. It is true that he only won by a few inches, but it is not true that he was not the best disc-thrower in the contest. The Greeks had practised with the disc for a considerable time, and indeed it is an ancestral sport of theirs. The American, whether he had practised with anything resembling a disc before or not, undoubtedly had never seen a disc like that with which he threw till the morning of the contest. What, then, is the explanation? Simply this—the best of the Greek throwers was not really good at all. 95 feet is an absurdly short distance to throw a flat missile of under four and a half pounds. Had English or American athletes practised the sport, the record would have been nearer 130 feet than 95 feet. The American won simply because he was accustomed to the throwing of weights, and knew how to bring his strength and weight to bear on the missile. The Greek had brought the knack of throwing to greater perfection, but one could see that he did not know how to apply any large portion of his strength to the throw. We now come to the great glory of the Greeks—the victory in the Marathon Race. This event was reckoned the chief feature of the meeting, and in many ways it deserved its position. It possessed greater historical interest than than any other of the competitions, and was, no doubt, also the greatest criterion of endurance. The race was won by a Greek, who had hitherto no reputation. The second was a Greek, who had already won one of the trial races. It certainly seemed to the impartial spectator that the winner was nothing of a runner. He arrived in the Stadium with a stride of a foot or so, but apparently not much exhausted. The second man arrived in excellent style, seven minutes behind him. We can only explain the fact by supposing that the winner succeeded by monumental perseverance at a moderate speed, though, strangely enough, his time for the distance was really first-rate. It must be remembered, however, in comparing his time with the track-record, that a road course is very favourable to fast times—the remarkable performances recorded in the Eton Mile are sufficient proof of this. Now we do not wish to minimize the Greek victory, but only seek to regard it fairly. A statement was made in a daily journal not long since, by one who writes in true Greek style under the initials “J.G.,” that “the well-trained English and American athletes had been defeated by the Greeks who had no real training.” This is an absurd misrepresentation. Does “J.G.” really suppose that the English system of training cannot render a man capable of finishing in a race of twenty-five miles along a road, but that that feat is reserved for the heaven-gifted and nature-nursed Greek athlete? As a matter of fact, the Englishman arrived in Athens ten days, the American five days before the race. Neither of them did anything which could possibly be termed regular training during their stay, neither of them had even seen the course till they drove to Marathon the night before the race, and certainly neither of them had ever run over it. Their lack of training was shown in the fact that the Englishman ran in splendid form till six kilometres from home, when he broke down entirely; the American had given up a little earlier. The Greeks, on the other hand, had practised over the course for months, and had all been engaged in trial-races over the distance. Every cross-country runner must know the inestimable value of such experience. Let, then, the Greeks have every credit for their diligence in training, and the excellent form they showed, but let them not be led by irresponsible journalists to claim a measure of credit which is not due to them. The honour they have gained by the progress made in so short a time is great enough to enable them to dispense with false claims to distinction. OUR CRITICISM OF the athletic performances from a national stand-point has already shown in part that they did not reach a very high standard. The 800 metres race, for instance, equivalent to five and half yards less than a mile, was only accomplished in two minutes eleven seconds. The 1,500 metres, one hundred and twenty and a half yards less than a mile, occupied four minutes thirty-three and one-fifth seconds. We should have expected a half-mile in an international meeting to have been run at least well within the two minutes, and 800 metres, therefore, in four-fifths of a second or so less. 1,500 metres ought not to have occupied more than four minutes eight seconds. The 400 metres (437 yards) occupied fifty-four and one-fifth seconds—a moderately good time would have been fifty-one seconds. But in the times made in the longer races, two considerations have to be taken into account, one of which applies also to the shorter races. In the first place, the track was not in a satisfactory condition. The English ground-man, who was responsible for it, naturally found it difficult to obtain the necessary material in Athens, and, as a result, the track was not laid down sufficiently long before the meeting to enable it to be brought to proper perfection. Even after it was completed difficulties still had to be faced, especially the insufficiency of the water supply. At the time of the games, therefore, the track seemed to be over-hard underneath, while it was loose and treacherous on the surface. The ground man is not to be blamed at all for this; his energy and devotion did all that it was possible to do for the success of the meeting. In the second place, the shape of the track rendered fast times impossible. In ancient times, when the two limbs of the track were practically parallel, and the runners had to turn round a sharp corner at either end, fast running must have been even more difficult. Even in the present Stadium, where the track has been laid out in a more gradual ellipse, we calculated that the runners lost two seconds in every round, owing to the turns, in the two longest races, and three seconds in the 400 metre race. Thus we must make an allowance of four seconds in the 800 metres, and eight seconds in the fifteen hundred. The three seconds in the 400 metres is not at all an excessive allowance. The runners literally seemed to come to a standstill as compared with their previous pace, when they arrived at the bends. The record of twelve seconds for 100 metres (109·3 yards) was only average. Mr. Burke, who has competed against us with great success in America, could do much better under more favourable conditions. A fortnight’s travelling does not produce a good state of training. 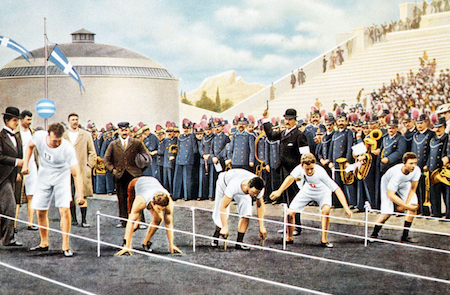 The 110 metres (120 1/5 yards) Hurdle Race took considerably longer than one would have expected, judging from the excellence of the competitors; the result may have been due in some measure to the unusual arrangement of the hurdles. The results obtained in the disc-throwing and weight-putting we have already criticized sufficiently. The jumping was the most satisfactory portion of the athletics. The triple jump is not customary in England, but to the unaccustomed eye Mr. Connolly’s performance seemed as good as it could be. For the pole-jump America had sent over two of her best performers, and the height cleared, 10 ft. 9¾ in., does not compare unfavourably with the record of 11 ft. 5 in. for this style of vaulting (without climbing). Mr. Clark, of Harvard, performed splendidly both in the high and long jumps; in the former he cleared 5 ft. 11¼ in., 6 inches more than his opponents, in the latter 20 ft. 9¾ in. 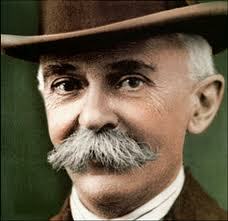 The latter performance is not remarkably good on the face of it, but Mr. Clark in reality jumped a great deal further. Unfortunately the committee were under an extraordinary delusion, which is not unknown in England, as to the manner in which a long jump should be judged. They attempted to decide after each jump, whether the competitor’s toe had projected over the take-off board, and consequently disqualified Mr. Clark’s best jumps. Everyone ought to know that the only criterion of a competitor having passed the board is failure in his jump. No one who passes the board can make a good jump. Even if it were possible, which it is not, to judge whether half an inch of his toe projects beyond the board, it stands to reason that he has taken fairly off the board, if his jump succeeds; and therefore it should be allowed. The result of this absurd judging was that the American competitors were forced for safety to jump from six inches or even a foot behind the line. The greatest uncertainty was always allowed to prevail as to the events which would take place on any particular day, and as to the order in which they would take place. Competitors had, as a rule, to rely upon the slippery authority of the Greek newspapers. WE MAY NOW turn from the athletic results of the games to the organization, and first to the organization of the athletics themselves. It was only to be expected from the inexperience of the committee that mistakes would be made. Mistakes were made, but they were not very serious. The greatest uncertainty was always allowed to prevail as to the events which would take place on any particular day, and as to the order in which they would take place. Competitors had, as a rule, to rely upon the slippery authority of the Greek newspapers. Again, the committee had a firm belief in the inspired character of its own programmes. It desired them to be regarded as absolutely unalterable, and, when any impossible arrangement which they had made was pointed out to them, they required unlimited persuasion before they could be induced to alter it. For instance, the 800 and 1,500 metre races were to have been run in heats (the former was actually so run, though there were only nine competitors), and the finals of both were fixed for the same day as the final of the Marathon Race. An Englishman [Flack] was engaged in all three races, won two of them, and made a bold bid for victory in the third. It is needless to say that, had the committee been allowed to persevere, he would probably only have been able to run in one. Much time was wasted in the drawing of places for heats and other purposes. The competitors were expected to attend at the general office for an unlimited period over and over again. Time is of little value in Greece. There was considerable delay between the various competitions in the Stadium, and in the course of the competitions themselves. This was due, to some extent, to the distance of the dressing-rooms from the arena, fully 200 yards, and to the lack of accommodation for competitors in the arena itself. The high and pole-jumps commenced at ridiculously low heights, and became inexpressibly tedious. The latter, indeed, lasted no less than an hour and three-quarters. All these were, after all, minor blemishes, which were inseparable from the holding of a colossal meeting like the Olympic games in a hitherto unathletic country. Some of the confusion arose from the co-existence of two committees, the Greek organizing committee and the international athletic committee. The former had general superintendence before and during the games, the latter was confined to safeguarding the interests of the athletes of each nationality, and to judging the contests. It was inevitable that the two committees should clash now and then and interfere with one another’s arrangements, but such collisions were infrequent. The English and American competitors owe a great debt to Messrs. Finnis and Wheeler, their representatives on the committee, for the admirable way in which they protected their interests when it was necessary. But we are anxious to admit that the Greek organizers dealt with foreign athletes throughout in the most sportsmanlike way. Exceptions were very few, though in one instance we cannot but maintain that the right course was not pursued. A trial race had been held to select the Greeks who should compete in the race from Marathon. The race was run and the team selected. Entries for the Olympic Games closed, for Greeks, a fortnight before their commencement. A few days only before the games the Greek authorities seem to have become alarmed at the prospect of foreign competition in the Marathon Race, and especially at the fame of Mr. Flack, and, like the Nicias before the last sea-fight at Syracuse, thought that perhaps they had not yet done all that was possible. They held another trial race, selected a second team, which included the ultimate winner, and made a post-entry of it. We fail to see how this proceeding can possibly be justified. Such an action as this, however, was quite exceptional; as a rule, the treatment of foreign competitors by the Greek committee and the Greek people was extraordinarily liberal. While the organization of the actual athletics was, with the above-mentioned exceptions, wonderful under the circumstances, the organization of the meeting generally seemed to us to be very nearly perfect, and in connection with the organization as a whole, we should not omit to mention the untiring efforts of the three eldest Princes, whose absolute devotion—for we can call it nothing less—was of supreme importance to the general result. The Stadium holds something over sixty thousand spectators and on two occasions it was full to the uttermost corner. Yet we never observed any confusion or disagreeable incidents of any kind. There is no doubt that the Greeks are a patient people and allow themselves to be organized. The committee were fortunate in not having to deal with a north-country football crowd. The Stadium was divided into blocks and tickets were obtainable for a particular block. Within that block no definite seats were reserved, and consequently to obtain a good seat in one’s block it was necessary to arrive in the Stadium at a very early hour. But, inasmuch as the Athenian public, like the visitors at Bayreuth, lived for nothing but the games so long as they lasted, this expenditure of time was no great disadvantage. Perhaps, however, it may be permissible to suggest that on the next occasion the tickets for a particular day should be on sale a little earlier, and also that it would bring the games more into touch with ancient custom if the upper portion of the seats at least were not charged for. THE BEHAVIOR OF the crowd under very trying circumstances was most exemplary. The Greeks suffered one disappointment after another. Yet even when they lost the Disc, they showed no vigorous signs of disapproval. This may have been partly due to their temperament, which is not in the least emotional, but must also be attributed to a great extent to gentlemanly feeling. A still greater trial of their patience came when the Greek’s number was hoisted by accident as winner in putting the weight, soon to be replaced by that of the American. But as the public seemed disinclined for vigorous expressions of disapproval, so it also was incapable of expressing very great enthusiasm. Much has been written in the papers about the tremendous scene at the conclusion of the race from Marathon. The coup d’oeil indeed was surpassingly fine, but the outward expression of emotion really amounted to very little. It seemed to us that the five thousand people who were present at the conclusion of the Oxford and Yale sports in 1894, displayed, proportionately, much more outward enthusiasm than the one hundred and twenty thousand people who witnessed the termination of the Marathon race in 1896. Yet the whole scene can never be effaced from one’s memory. It was expected in Athens that swarms of foreign visitors would grace the games with their presence. The committee appointed Messrs. Cook their agents for foreign parts, and apparently thought that this alone was sufficient to ensure an enormous concourse of foreigners. This turned out to be a very unfortunate mode of procedure. The price at which the agents advertised rooms in Athens at the season of the games, abstained from going. We can vouch to having found several parties in Italy, who were intentionally delaying their visit to Athens till after the termination of the games. The audience, then, in the Stadium was almost exclusively composed of Greeks. The newspapers, both in Greece and England, continued, even after the end of the meeting, to estimate the number of foreigners present at twenty thousand. As a matter of fact, there can be no doubt that one thousand would be a large estimate. Foreigners may have won the greater part of the events, the sports may have been veritably international, but the body of spectators was not international at all. If “Olympic” in the modern sense means “international,” this audience was not an Olympic audience. The fact cannot be denied, the reason is not far to seek. The organization which failed to attract foreign competitors also failed to attract foreign spectators. The so-called agents of the committee only provided information if applied to, and even then the intelligence given was very meagre. 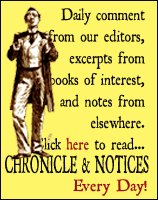 If one wrote to the central committee one was liable to be told that all information could be obtained by subscribing a considerable sum to the journal of the committee. Apparently the committee did not think it its duty or its advantage to supply information without immediate reward. The lack of foreign attendance at these games was peculiarly unfortunate because it may prevent their success from becoming duly spread abroad, and so may stand in the way of a favourable issue on the next occasion. We have called the games successful, but it may be thought that our comments hitherto point rather to failure than to success. What then was the peculiar triumph of these games? The triumph which was inseparably connected with them, the triumph of sentiment, of association, of distinction, of unique splendor. The Stadium was till very recently a scene of desolation. It became the property of the King; he, assisted by German advice, commenced the task of revealing its ancient glories. Much had been done towards restoring its original features, when the notion of an international athletic assembly was first suggested. An international committee was formed in Paris, mainly under the patronage of Frenchmen, and the international games were decided upon. It was then that M. Bikélas, the leader of modern Greek literature, suggested Greece as the scene of the first meeting. 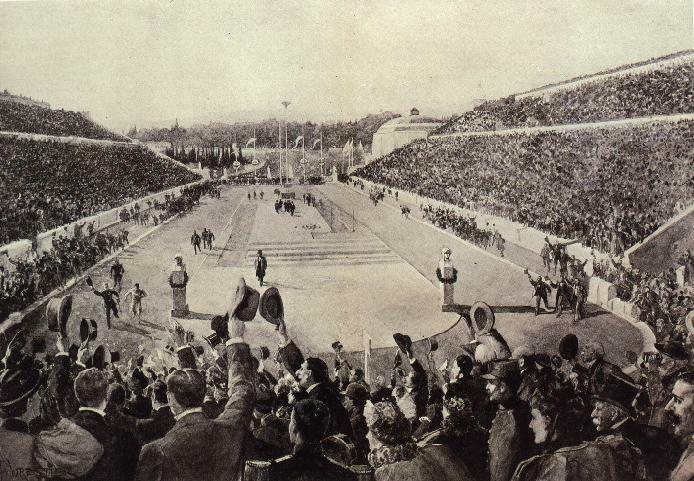 Olympia was out of the question as the place of contest, and all eyes were turned upon the Stadium at Athens. It was found that the configuration of the ground permitted the restoration of the edifice to something of its ancient magnificence with no very great expenditure. At this moment patriotism, as it has so often done in the history of modern Greece, came to the assistance of the nation. M. Averoff, of Alexandria, professed his readiness to bear the cost of the restoration, and even, like a second Herodes Atticus, to restore the whole building in Pentelic marble. The genius of M. Metaxas, the architect, carried the work to a temporary termination. The Stadium is not yet completed in marble; that task is already being performed and will be ended by the next Olympiad; but the whole stands even now in all essentials the same as in the third century of our era. Twice was the vast arena filled to the uttermost with its sixty thousand eager watchers, twice the expectant throng completely hid M. Averoff’s marble and its wooden substitute from the eye. On one side of this vast area rises a peaked hill, gently sloping at the angle of the seats; on this was packed an even denser mass, numbering perhaps some twenty thousand. All round the upper rim of the Stadium another crowd was closely pressed, resting at the extreme ends of the line, where the Stadium projected from its guardian hills, upon a narrow ledge backed by a sheer fall of forty feet or more. Before the broad entrance, on the level road without, was another crowd, eager as the others, but entirely shut out from any view of the contests; it extended for fifty yards in either direction from the barrier and may be estimated also at twenty thousand. ON EVERY DAY of the meeting the crowd present was enormous, but the two central moments were the conclusion of the Marathon Race and the presentation of the prizes. Then every available inch of space was occupied. The onlooker could think of nothing but that he had before him a serried throng of humanity, greater than any that had been marshalled before man’s sight hitherto. The competitor, as he hurried through the gloom of the ancient tunnel, the Crypte, which led from his quarters on the hill behind to the arena, if he possessed a particle of imagination, felt himself now to be a Phayllus or a Phidippides, about to accomplish feats to excite the amazement, and arouse the suspicions, of all future times, now a martyr of the early Christian ages, whom a lion or a bear awaited where the gloom gave way to the sunlight. The spectator, on the one side, gazed towards the temple of Zeus Olympius and the Museum Hill, and further to the north, where the Acropolis shut off the Sacred Way, on the other side he looked towards Marathon and upon so much of Lycabettus as the committee’s great panorama of lath and plaster permitted him. Behind all rose crimson-tinted Hymettus, and, beyond it, purple Pentelicus smiled upon its off-spring. Over all was the friendly sun and the “delicate” air. Such was the scene, unsurpassed and unsurpassable. Who, who was present there, does not wish that he may once again be permitted to behold it? After the ode had been recited and the olive-branches presented, everyone’s first desire must have been for a repetition of the whole. The feeling of absolute entrancement with the beauty of the sight, the rapture of sensation, and the joy of recollection, which overmastered all who shared in this spectacle, found vent in ardent wishes that the Olympian games should be reserved to dignify Athens and to be glorified by her glory. No one, while under the glamour of the moment, could have ventured to oppose this suggested reservation, and even now, when the splendor has somewhat faded from the mind, it is difficult to criticize this impulsive proposal. Yet it has great practical difficulties to face. In the first place, it would have to meet French opposition of the most forcible kind. The French regard themselves as the nursing-fathers of the first Olympic Games. 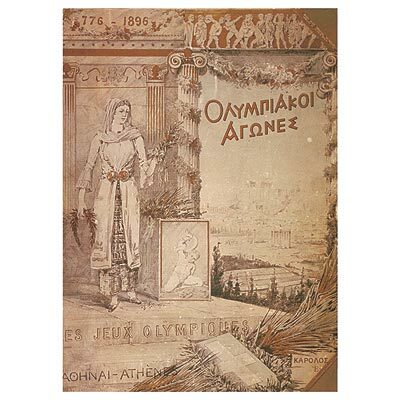 They consider the permission granted to Greece to hold the first meeting at Athens as a special favour, which is bound up inseparably with the stipulation that the next Olympic Games shall be held in Paris is 1900. It seems likely that Greek enthusiasm, aided by considerations of sentiment and propriety, might under ordinary circumstances carry the day against French contentions. The Greeks would be supported by the whole body of scholars and lovers of antiquity and by most educated athletes. Unfortunately the French have a most powerful ally to support their claims—their great Exhibition. These games, if held at Athens, would be Olympic but, we fear, not international; if held elsewhere than at Athens, international but not Olympic. Even supposing that the Greek arguments prevailed, we cannot doubt that Paris would hold a rival international meeting. In that case we must fear that Paris and modern display, within a moderate distance of Central Europe, would prevail against Athens and the soberness of antiquity in the remoter East. The opposition between the claims of utility and of taste and sentiment in this matter seems to be irreconcilable: on the one side we have the probability of a truly representative international meeting, conducted on purely modern lines, in a modern arena unconnected with the memories and glories of the age which has provided models of grace and strength for all time, on the other we find the possibility of non-representative competitions, held in a spot which, with every beauty of form and position, is connected undyingly with all the magnificence of that golden age of athletics, whose ideals it should be the object of these international gatherings to promote. The opposition is so sharp that it would be fair to describe it by asserting that these games, if held at Athens, would be Olympic but, we fear, not international; if held elsewhere than at Athens, international but not Olympic. 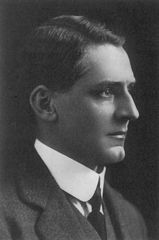 George Stuart Robertson was an Oxford classicist. His discus throw of 25.2 metres was the worst ever recorded at an Olympics, but he did win a bronze medal in doubles tennis. He also wrote and famously recited the Pindaric ode he mentions above at the conclusion of the games. It appears in the Fortnightly here. Also in the Fortnightly: Alan Macfarlane’s chapter on the importance of games in English culture. Elsewhere: In Running Past, American athlete Ellery Clark’s memoir of the 1896 games. This article first appeared as ‘The Olympic Games’ in the Fortnightly Review, June 1896 (65 OS, 59 NS), pp 944-957. It has been manually transcribed for the New Series. Minor alterations have been added to track subsequent republication, permission for which requires written permission. This Fortnightly Review article is filed under the following rubrics: Chronicle & Notices, Events, History & Travel, Principal Articles, Sport & Fashion. Publication: Sunday, 8 July 2012, at 15:29. Options: Archive for George Stuart Robertson. Bookmark the permalink. Follow comments here with the RSS feed. Post a comment or leave a trackback. ‹ When politicians talk of ‘creativity’ in education.